The Missus couldn’t go shopping yeaterday and she had to make do with what was left available this morning (BG will probably comment that I’m bonding the Missus into slavery!). But apparently there was still plenty left in fridge and the “pantry”. She steamed plain sushi rice she mixed with edamame boiled the precious evening and added some seasme seeds for seasoning. There was still one frozen duck confit left in the freezer. The benefits of internet were clearly felt there. The Missus orders a lot of French ingredients dirctly from Dining Plus, a Japanese import Company based in Osaka, with a great list and very fast service. You don’t really need to unfreeze the duck confit in a hurry. Just Put it on a teflon non-stick frypan and cover it. It will cook to a crispy state in its own fat. Once cooked you, you tsrip the bone (“for me!”, said the Missus. BG, keep quiet!) and cut or shred the meat. Don’t forget the crispy skin, it’s beautiful! 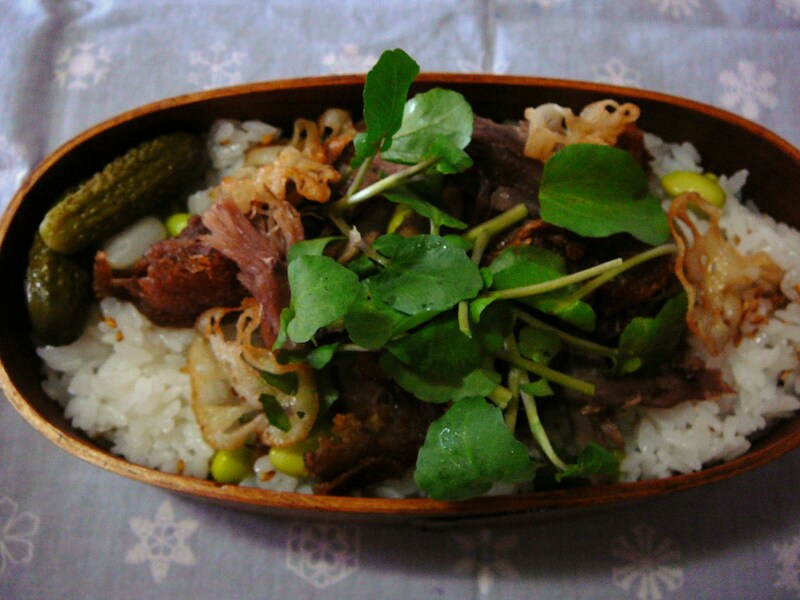 She topped the rice with plenty of shredded duck confit (cooled down), Shizuoka-grown cress, and deep-fried (small) renkon/lotus root slices. 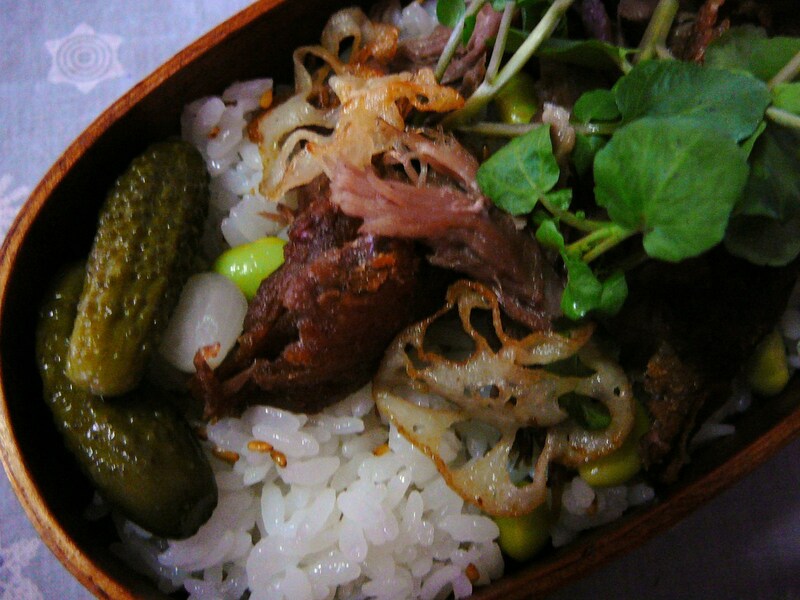 French pickles were added to contribute another French note to the bento. I should have called it “French Sushi Bento”! 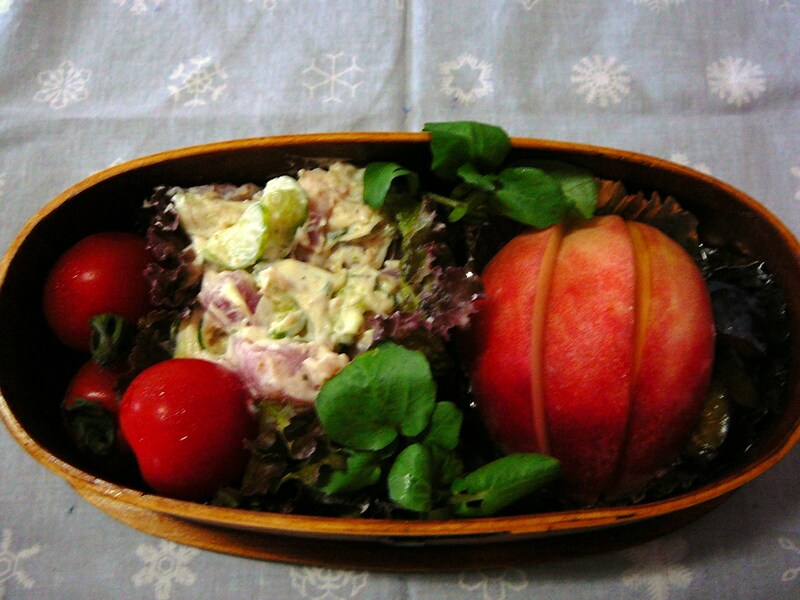 The dessert/salad dish included mini tomatoes, pink and yellow potato salad on lettuce. Dessert wers plums (the Japanese call them “prunes”, another Japlish word! ), and sliced peach. Another solid bento for this stamina sapping weather! 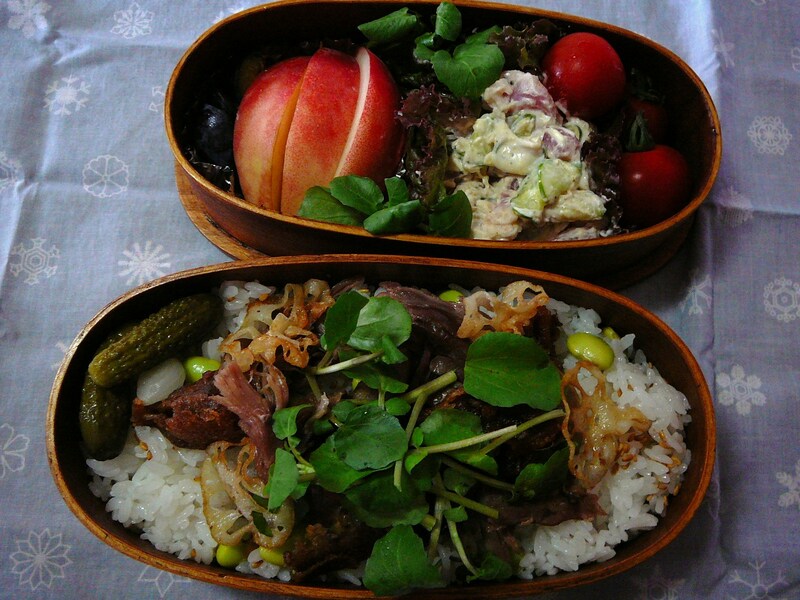 Previous PostToday’s Lunch Box/Bento (’10/57): Shake Maze Sushi BentoNext PostSushi Cupcakes: For an easy Party!